Laverne E. Sermersheim, age 89 of Jasper, Indiana, passed away at 8:35 a.m. on Wednesday, August 15, 2018 at St. Charles Health Campus in Jasper. Laverne was born in Jasper, Indiana on July 11, 1929 to Anita (Brelage) and Leo Durcholz. She married Jerome A. Sermersheim on September 25, 1948 at St. Mary's Catholic Church in Ireland, IN. He preceded her in death in 2008. She was a waitress at Heichelbech's Restaurant for 32 years. She was a member of St. Mary's Catholic Church in Ireland, St. Anne's Society, and TOPS. 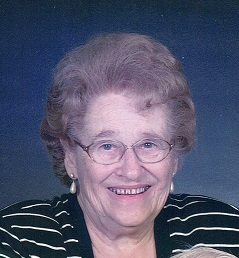 She enjoyed her friends, hosting parties, and spending time with her grandchildren. Surviving are four daughters, Connie (Bernie) Helming, Jasper, IN, Bonnie Keusch, Ireland, IN, Carla Matheis, Jasper, IN, Lori (Matt) Koerner, Washington, IN, five sons, Gary (Charlene) Seremersheim, Ireland, IN, Mark (Sharon) Sermersheim, Ireland, IN, Nick (Tammy) Sermersheim, Ireland, IN, Jeff (Patty) Sermersheim, Stendal, IN, Daryl (Beth) Sermersheim, Boise, ID, 32 grandchildren, 39 great-grandchildren, and 4 great-great grandchildren. Preceding her in death besides her husband, are two sons, Reg and Duane Sermersheim, a son-in-law Dennis "Red" Keusch, and grandson, Derek Arvin. A Mass of Christian Burial for Laverne E. Sermersheim will be held at 10:00 a.m. on Monday August 20, 2018 at St. Mary's Catholic Church in Ireland, Indiana with burial to follow in the church cemetery. A visitation will be held from 2:00 p.m. until 8:00 p.m. on Sunday, August 21, 2018 at the Becher Kluesner North Chapel in Jasper.